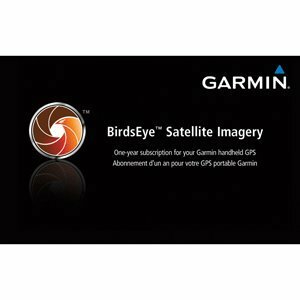 Garmin BirdsEye Satellite Imagery Retail Card (38185) by Garmin at iShare Maps. MPN: 38185. Hurry! Limited time offer. Offer valid only while supplies last. BirdsEye Satellite Imagery subscription allows you to tranfer an unlimited amount of high-resolution satellite images to your Garmin handheld device. BirdsEye Satellite Imagery subscription allows you to tranfer an unlimited amount of high-resolution satellite images to your Garmin handheld device. The data for this subscription is provided by DigitalGlobe which can be managed and loaded onto your device using Garmin's BaseCamp application. With BirdsEye Satellite Imagery, youc an load highly-detailed aerial and satellite images to your Garmin handheld device. The geo-referenced images result in real-life photos of buildings, roads, trails and other land features. This helps you get a true representation of your surroundings as you explore. Plus, with 0.5 meter-per-pixel resolution in many areas, and zoom levels from 12 miles to 20 feet, you will have the most highly-detailed maps available. DigitalGlobe continuously expands the coverage areas and imagery quality, which is automatically available to the user during the subscription period. You can also overlay vector maps, such as TOPO US 100K or TOPO US 24K, on your handheld for a better understanding of terrani contours and other topographic features. Before you can use the BirdsEye Satellite Imagery subscription, you must have Garmin's free BaseCamp software installed on your computer. To download BaseCamp visit: www.garmin.com/basecamp. You will also need a myGarmin account to register your device in order to activate the subscription. You may create an account during the purchase process. Use with the following compatible units only: Dakota 10, 20, Colorado 300, 400i, 400c, 400t, Oregon 200, 300, 400t, 400i, 400c, 450, 450t, 550, 550t. Note: The subscription may only be used with one compatible device. Please purchase additional subscriptions for additional devices. Polyplanar - Poly-Planar Ma840 (W) Sub Compact Box Speaker 80 Wat "Product Category: Entertainment/Speakers"